• For quantitative determination of D-sorbitol and evaluation of drug effects on sorbitol metabolism. • Fast and sensitive. Linear detection range (20 μL sample): 5 to 1000 μM D-sorbitol. • Convenient and high-throughput. Room temperature assay. No 37°C incubator required. Homogeneous "mix-incubate-measure" type assay. Can be readily automated on HTS liquid handling systems for processing thousands of samples per day. • Biological (e.g. blood), food, beverage and agriculture samples. • SORBITOL (glucitol) is a sugar alcohol that is metabolized slowly in the human body. Sorbitol can be obtained from glucose by reducing aldehyde group to a hydroxyl group. Accumulation of excessive sorbitol in erythrocytes, retinal cells, and Schwann cells has been associated with retinopathy, cataracts, peripheral neuropathy and diabetes. Sorbitol is made solely from corn syrup, and found in fruits such as apples, pears, peaches, and prunes. It is widely used as a sugar substitute and as a laxative. It is also utilized in specialty culture media and in healthcare, food and cosmetic products. Sorbitol is measured in biological samples to monitor metabolic pathways and the progression of diabetes. BioAssay Systems sorbitol assay involves an end-point enzyme coupled MTT/NAD reaction that forms a colored product with an absorption maximum at 565 nm. 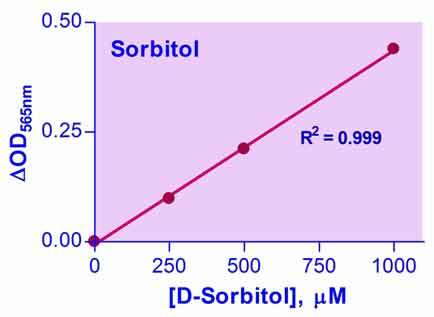 The increase in absorbance at 565 nm is directly proportional to the sorbitol concentration.